Edraw offers a smarter drawing mode to create work breakdown structure diagram then exports to MS Word document. Free Download. Work breakdown structure is a detailed, hierarchical tree structure of deliverables and tasks that need to be performed to complete a project. The purpose of a WBS is to identify the actual tasks to be done in a project. WBS serves as the basis for much of project planning. Work breakdown structure is, perhaps, the most common project management tool. Applying a WBS chart is a more intuitive and influential method to planning and displaying a project. Edraw Max provides an innovative approach to visually and graphically create, edit and modify work breakdown structure diagrams. It encompasses many cutting-edge tools for advanced drawings. In the Project Management category, you can double click the Work Breakdown Structure icon. The relative WBS templates will be opened in the symbol panel. Create WBS Quickly - Create WBS quickly and easily in Edraw using a "top-down" approach. You only need to click, drag and drop to create tasks and phases. Reorganizing the tasks in the chart requires only click of a button. High Level and Detailed Display of Your Projects - Present all levels of details or roll-up details to display a high level plan with vivid infographic charts. Present an Unlimited Number of Fields - This program can display any number of data fields in the task boxes. See exactly the information you want, arrange the way as you like it with the information automatically rolled up to the various levels of your plan. Print Scaling - Mass printouts to any number of pages using any printer. 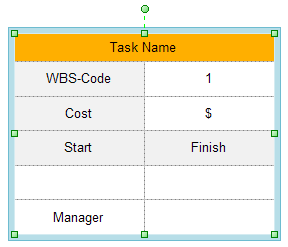 Automatically increase the size of the WBS chart to the defined paper size. It also supports all Windows compatible printers and plotters. What you see is what you get. Save as Picture - Save a WBS chart to different file formats including PNG, BMP, JPG, GIF and TIF. Include these WBS chart images in other documents or incorporate them into a web page. Unlimited Capacity - With the new architecture of our program, your WBS charts can be any size and contain any number of tasks. When you are drawing, you don't need to switch page. The canvas will expand automatically and infinitely. No matter how big your dream is, we are able to help you present it. All you need to do is imagine at will. Adjust for Page Breaks - Our software automatically adjusts tasks so boxes will not be split on a page. Compatible with MS Office - It is completely integrated with Microsoft Office application and easy to share. SVG Format Results - As a vector-based software, Edraw exports WBS charts as SVG documents which can be styled and modified using vector editors like Adobe Illustrator and Inkscape. The exported editable SVG files are fully fledged documents that can be viewed in any web browser as well as be imported into Microsoft Visio. One file format, infinitely accessible! Great! The following WBS templates are free to reuse and redesign. All symbols are vector and smart. The designer can edit data in the WBS symbols, add hyperlink, add row, remove row, change style, etc. The designer can use the table tools to change the symbol style easily. Edraw software can also export the word breakdown structure diagram to MS Word, text, PDF or graphic formats.